The Smooth Concealment Holster is the ideal balance of firm protection and soft comfort. 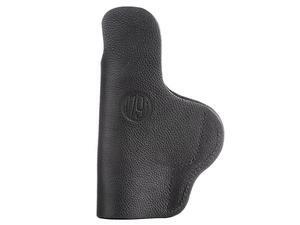 Providing complete concealment and convenience, the holster was designed with consideration to both the protection of your firearm and your skin. The Second Amendment was created to be exercised and there is nothing more American than handcrafted, American leather, gun accessory products. The Smooth Concealment Holster is the ideal balance of firm protection and soft comfort. Providing complete concealment and convenience, the holster was designed with consideration to both the protection of your firearm and your skin. The Smooth holster is handcrafted using Premium American leather. High quality, American made steel clip ensures safe retention.